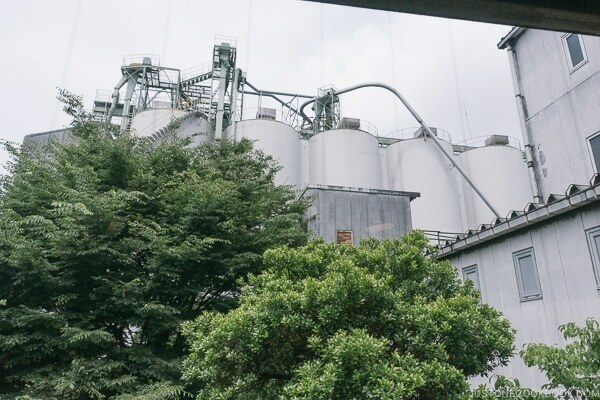 Join us on the Kikkoman Factory Tour in Noda, Japan and learn how soy sauce is made. 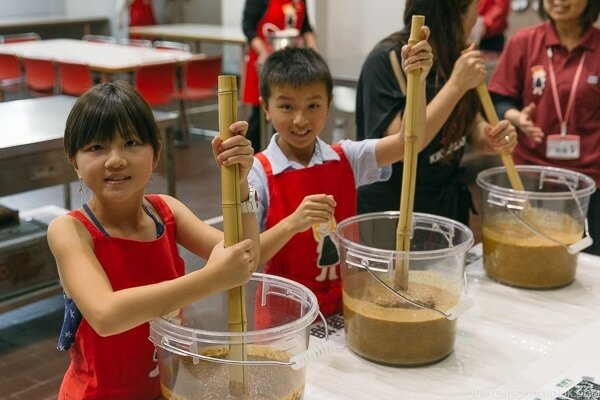 We had hands-on experience making soy sauce ourselves and toured Goyogura – the Imperial Soy Sauce Brewery. 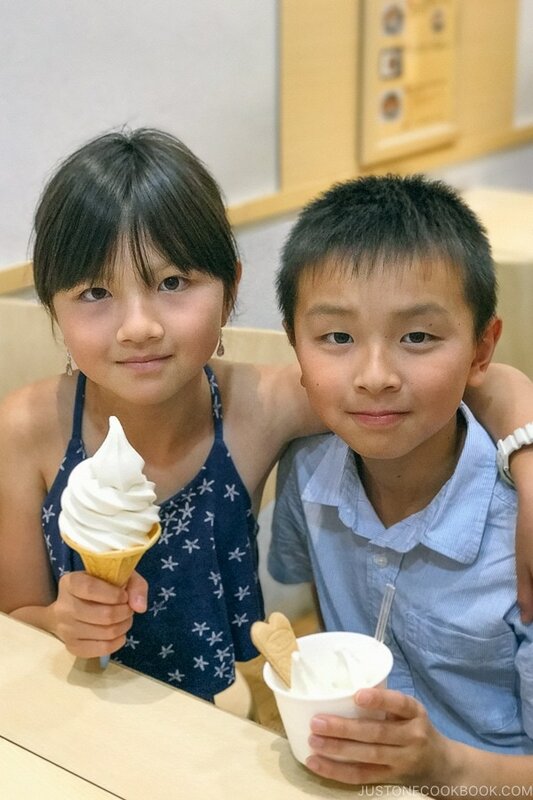 As a couple who are passionate about food, Nami and I try to educate our children as much as possible about where our food comes from and how they’re made. 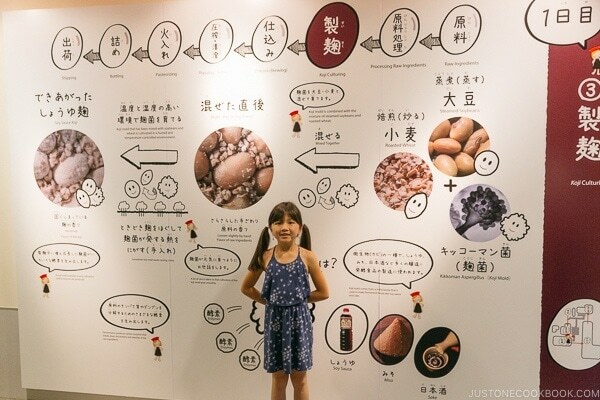 Last summer while visiting Japan, our partner and favorite soy sauce brand Kikkoman invited us to participate in Kikkoman Factory Tour in Noda, Japan and learn how their soy sauce is made! 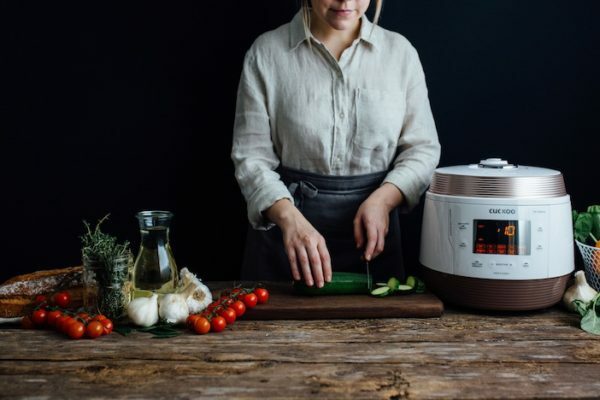 I personally love learning how products we use in our daily lives are created. One of my favorite tv shows is How It’s Made which I can binge watch for hours. 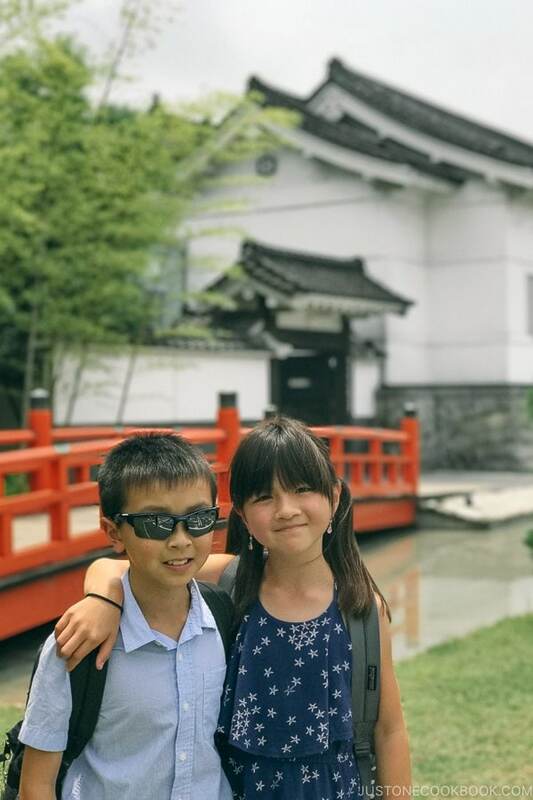 On our family trips, we’ve visited rice mill, confectionary, fish cake, jelly belly, beer, and various other food factories. 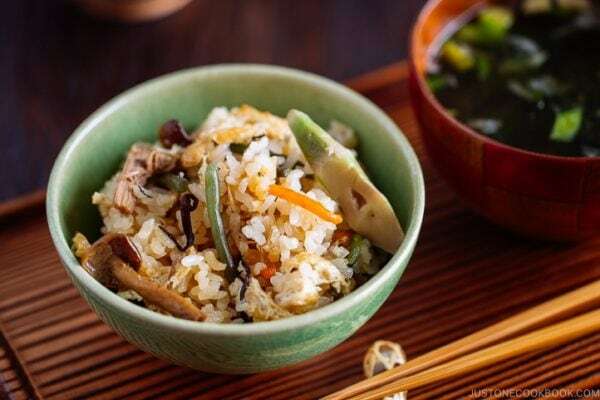 Since one of the products Nami use the most in her cooking and we eat almost daily is soy sauce, we were excited to see how this magical umami sauce is produced. 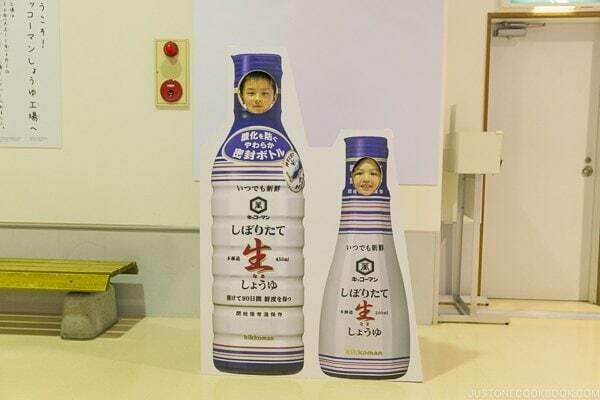 Kikkoman Factory in Noda Japan. 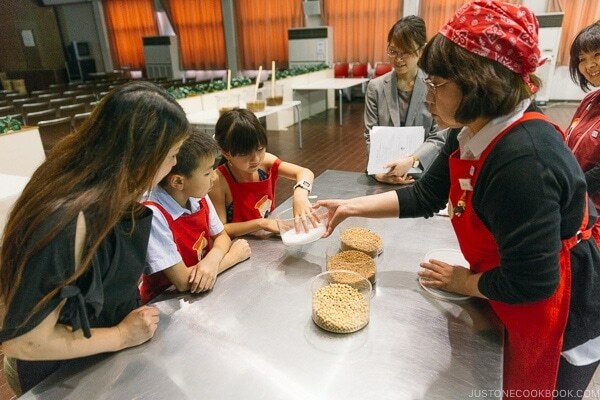 The first part of our visit consisted of learning how Kikkoman makes their soy sauce. Did you know they only use 6 ingredients used to make their amazing soy sauce? It was really surprising for us to learn such a tasty condiment is made with just these simple ingredients. The secret to Kikkoman’s excellent flavor? 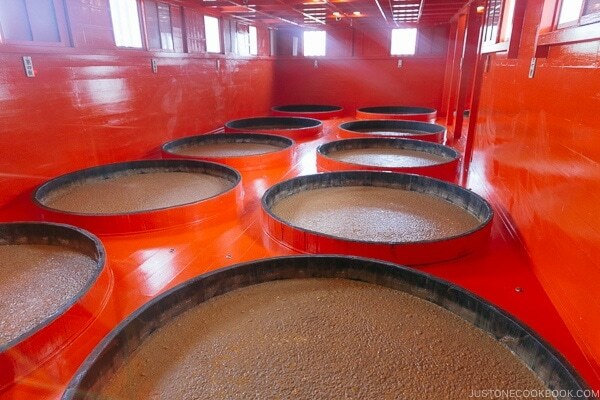 Their proprietary Koji (Kikkoman Aspergillus). There were no pictures allowed for the production facility so the best we can share are the illustrated signs. 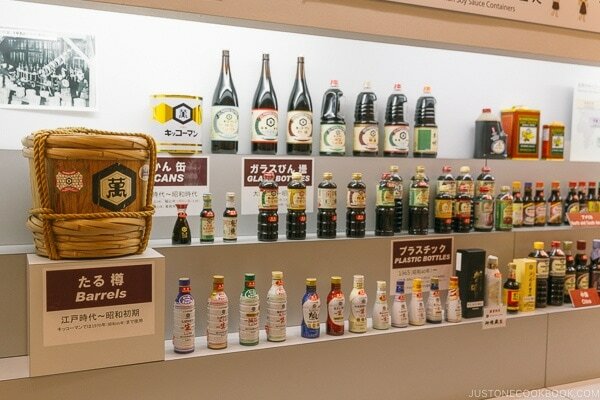 There are many soy sauce producers in the world but Kikkoman stands out by producing their soy sauce still using the traditional Japanese brewing process – honjozo. The raw ingredients for making soy sauce. 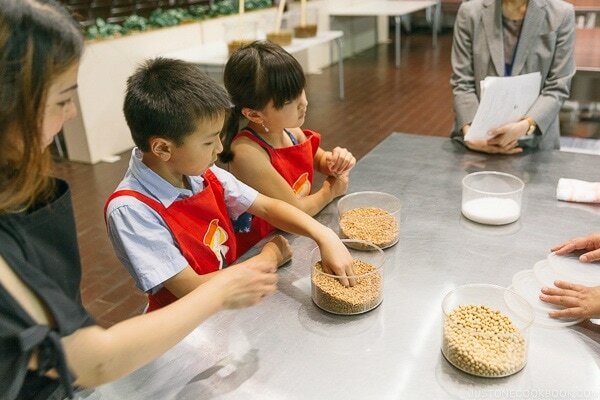 Soybeans and wheat are cooked and mixed with koji (3 days). The mixture of soy sauce, koji, and brine is called Moromi (6 months process). This is the magic that gives soy sauce it’s unique flavor and color. 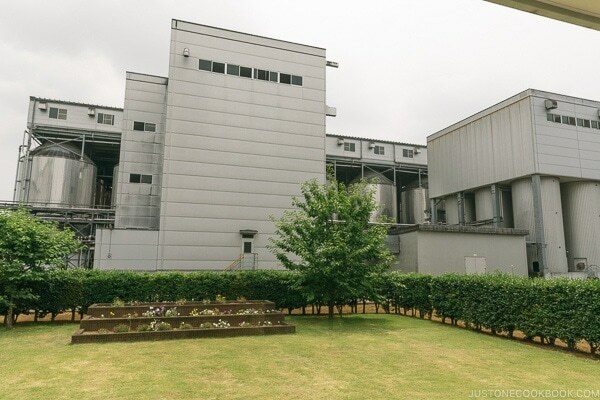 Moromi is fermented and aged in these storage tanks. Moromi is loaded into fine mesh cloth and pressed. 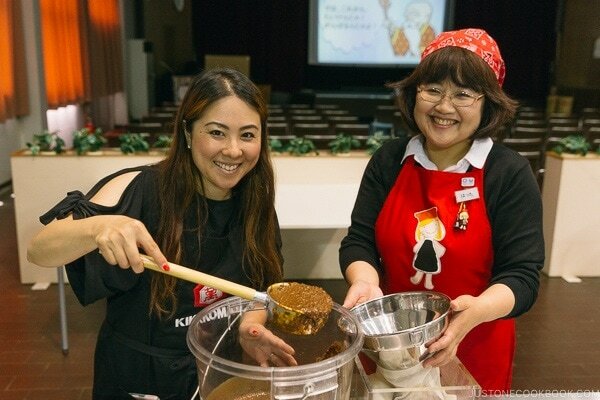 The cloth used by Kikkoman is 1.7 miles (2.8 km) long. Once squeezed from the cloth, soy sauce is heated and pasteurized, then bottled. Different vessels used to bottle soy sauce. 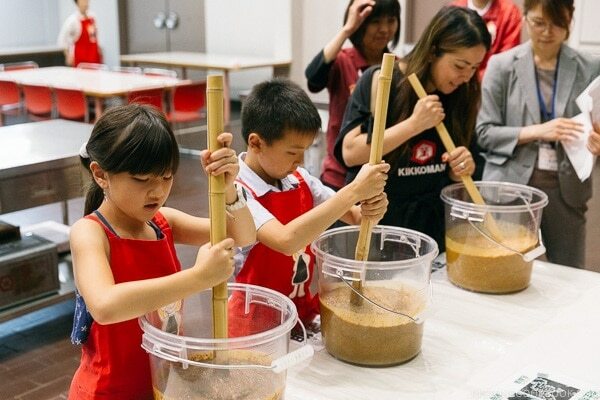 After learning how soy sauce is made, we got to make soy sauce ourselves as part of the Kikkoman Factory Tour! Since we don’t have 6 months to make the soy sauce, after completing each step, the Kikkoman team sped up the process by supplying with what the finished result would be so we can continue to next step. 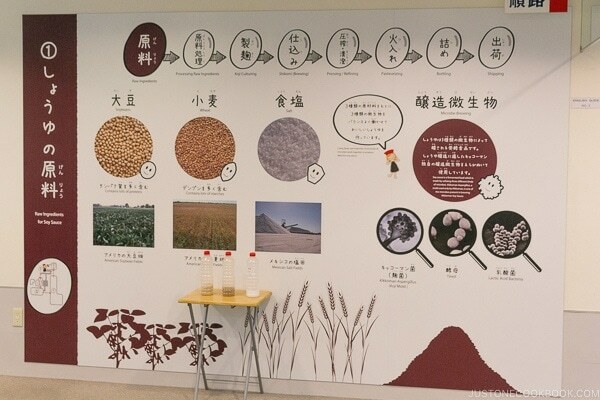 The primary materials for making soy sauce, soybean, wheat, and salt. 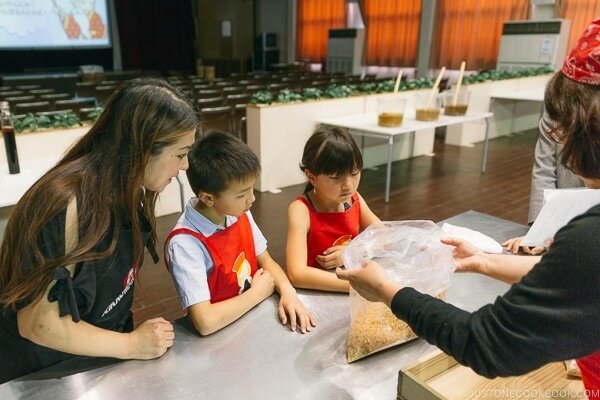 The Kikkoman team provided a bag containing the ingredient mixture that’s already cooked and added koji. The resulting product is called shoyu koji. 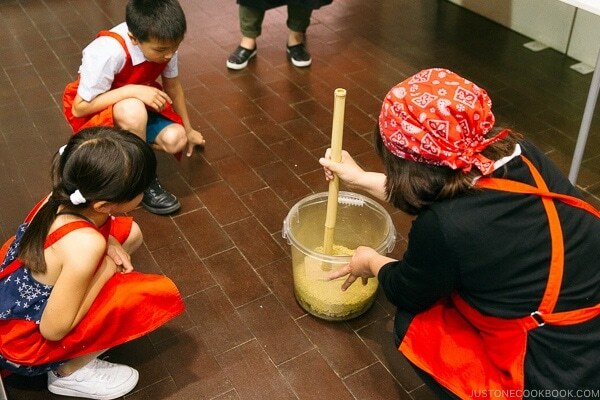 When koji mold is cultivating, it generates heat. We were provided a sample to touch and feel. It was interesting to sense the warm heat with our hands in the mixture. 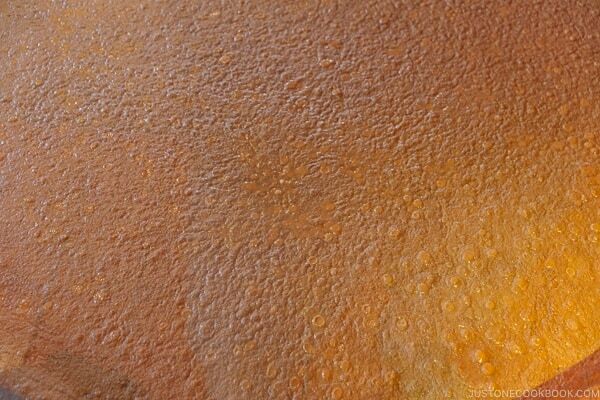 The next step is for the shoyu koji to mix with brine and let it ferment. The resulting product is called moromi (もろみ). Different stages of moromi in the images below, right after mixing, 2-3 months after, and 4-6 months after. The color gets darker as it’s further along in the fermentation process. 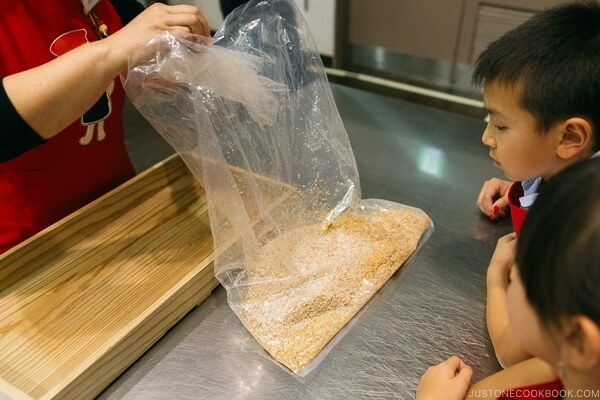 The Kikkoman team prepared moromi that’s already aged for us to scoop into fine mesh bags. The bags are folded then a weight placed on top of the bag. We pressed on the weight to squeeze out soy sauce. 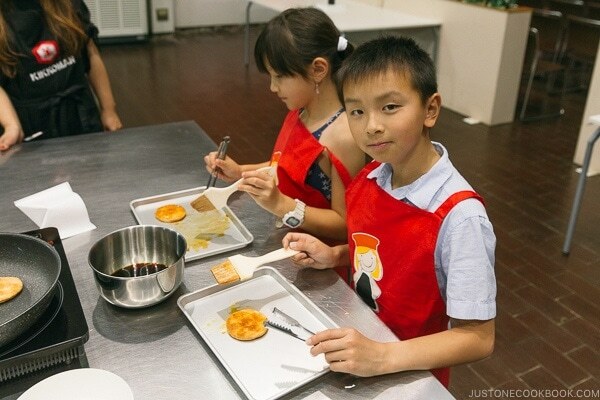 After making soy sauce ourselves, we got to enjoy making traditional Japanese rice cracker Osenbei, flavored with – soy sauce! 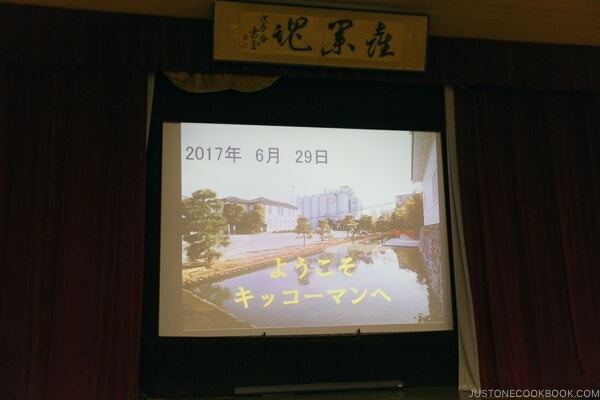 The next part of Kikkoman Factory Tour is to visit the Imperial Soy Sauce Brewery – Goyogura (御用蔵) on the Kikkoman factory premise. 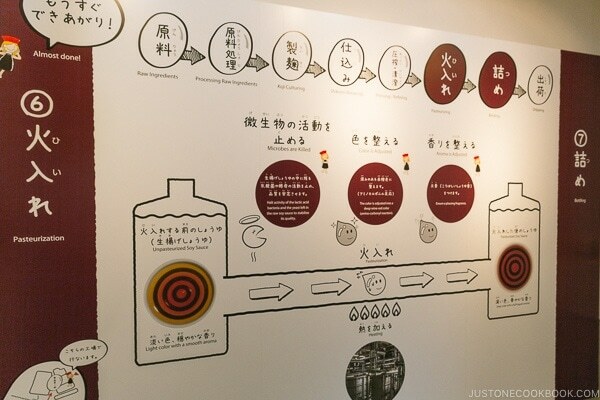 This is where the soy sauce for the Japanese Imperial family is made using traditional methods, instead of 6 months, the imperial soy sauce takes 1 year to make. 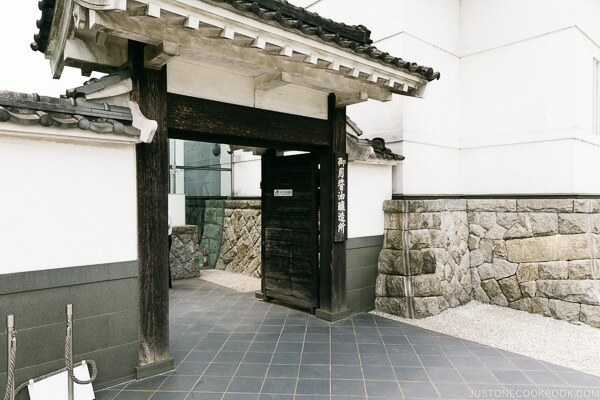 The original storehouse was on the banks of Edo River. The current building is reconstructed using many of the building material from the old storehouse. 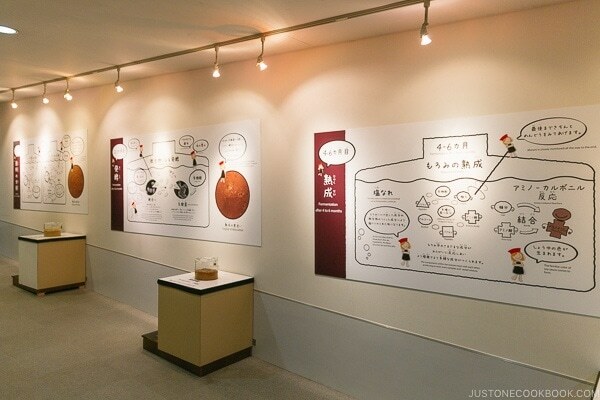 A few of the exhibits inside the Imperial Soy Sauce Brewery had augmented reality display, where visitors can enter the set and it looks as if they are working with virtual workers. 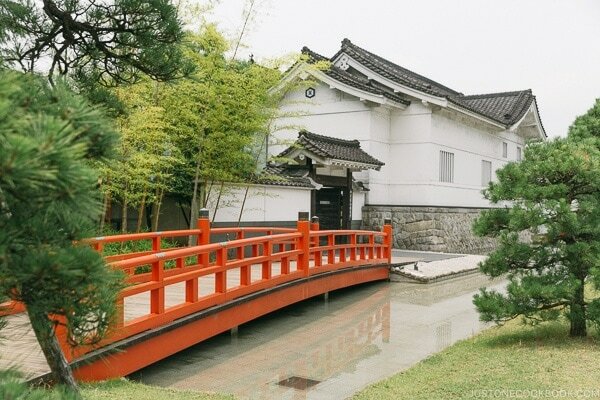 The purpose of the Imperial Soy Sauce Brewery is to serve as both a soy sauce museum and to make soy sauce for the Imperial household. Antique vats and equipment traditionally used to make soy sauce were on display. The vats where the Imperial soy sauce is being brewed. 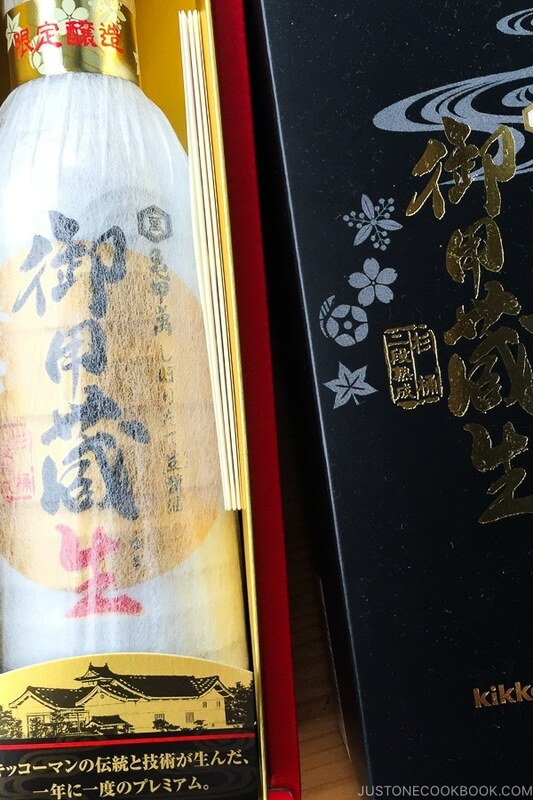 You can purchase the imperial soy sauce in the gift shop and online in Japan. Our final stop was the cafe next to the gift shop, and guess what we’re eating. Soy sauce ice cream! 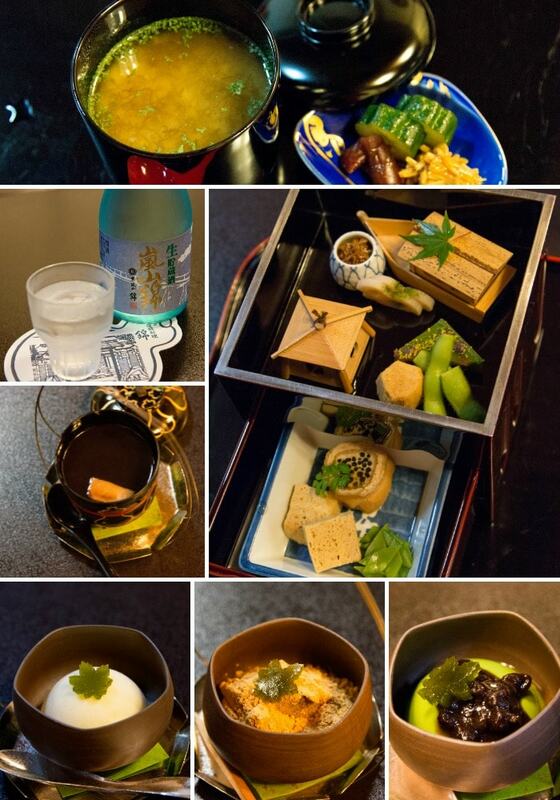 It was very yummy with vanilla taste and umami finish. 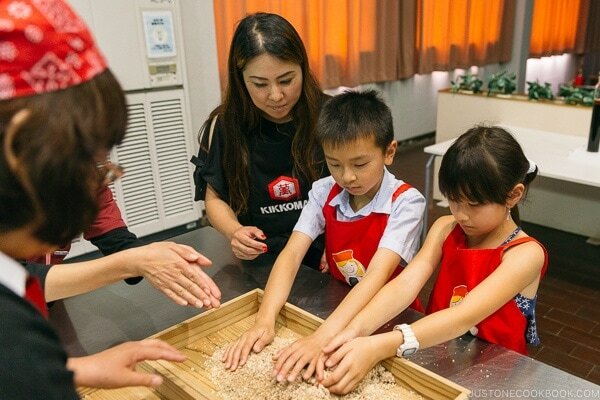 Thank you Kikkoman team for hosting Just One Cookbook family and letting us make soy sauce! We had a marvelous time learning how one of our favorite condiments is made and making it ourselves. 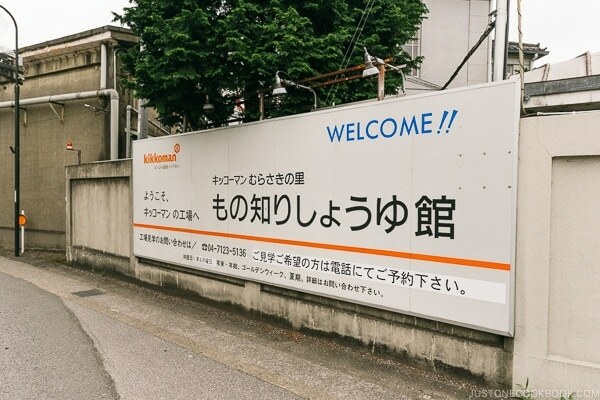 We hope you enjoyed the Kikkoman Factory Tour with us. 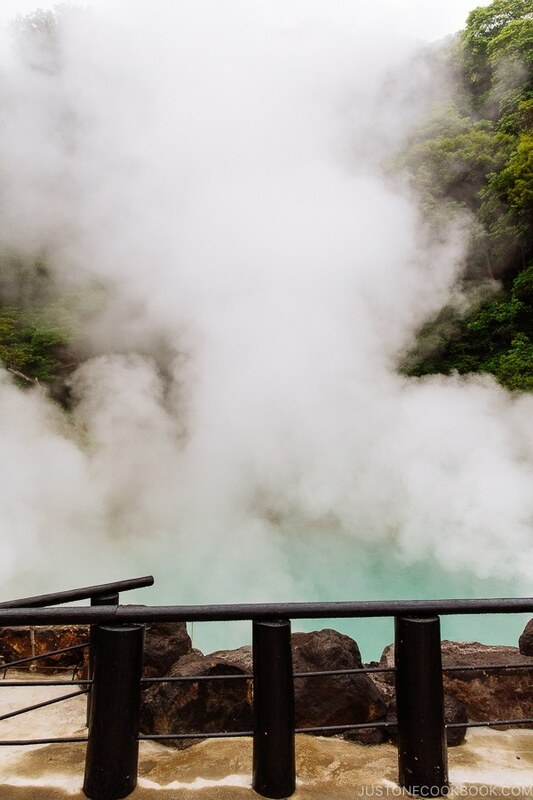 If you are are interested in our Travel Blogs, you can view them here. Sign up for the free Just One Cookbook newsletter delivered to your inbox! And stay in touch with me on Facebook, Pinterest, YouTube, and Instagram for all the latest updates. Buy our best-selling e-cookbook for 33 more easy and simple recipes! Thank you for your sweet comments! Was the soy sauce you enjoyed on the cracker from the batch you made? 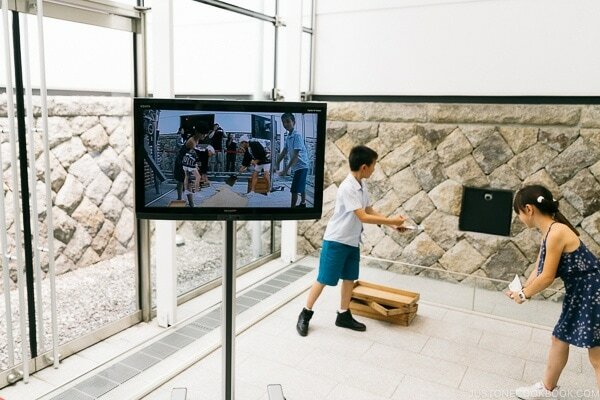 It looks like such a fun museum trip! No, the soy sauce was not from the batch we made. 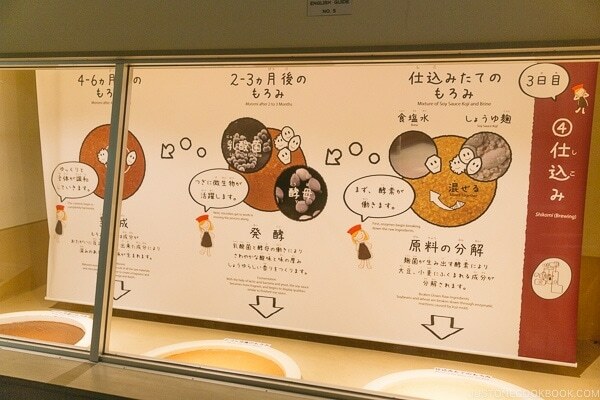 In fact, the Koji they used for the experience is also not the proprietary one, that one is secured and only used for Kikkoman’s production soy sauce. Kikkoman provided their soy sauce for us to make the crackers. Awesome! Thanks for sharing your experience. 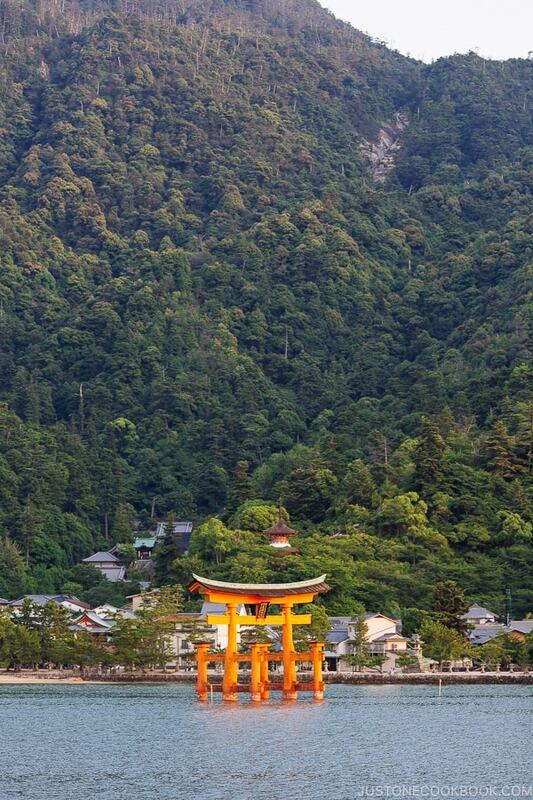 I would love to visit Japan one day. Your kids are so cute! Thank you for your comments. 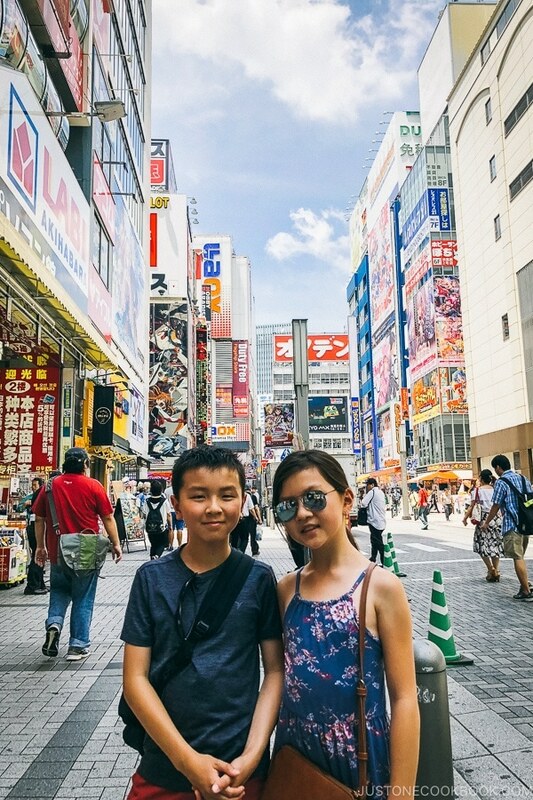 Let us know if you have any questions when you plan on visiting Japan. Thank you for your sweet comment. We’re just happy they’re willing to put up with our photo “asks”. Awww thanks for sharing! love reading this. So much fun!!! Will they open the factory for normal victors? If so how to apply for it? I believe they do provide tours of the factory if you make a reservation ahead of time, however, it’s probably only offered in Japanese. The number to call is +81 (4-7123-5136). I believe they do provide tours of the factory but it’s probably only offered in Japanese. The number to call is +81 (4-7123-5136). Thank you for your comments. We hope our travel posts are helpful for folks who are planning to visit the same places we did. Kikkoman is good stuff — it’s the soy sauce I always buy. I used to buy mainly Chinese soy sauces, but really think Kikkoman is better. Plus you can buy it everywhere! Sounds like a terrific tour — so much fun. 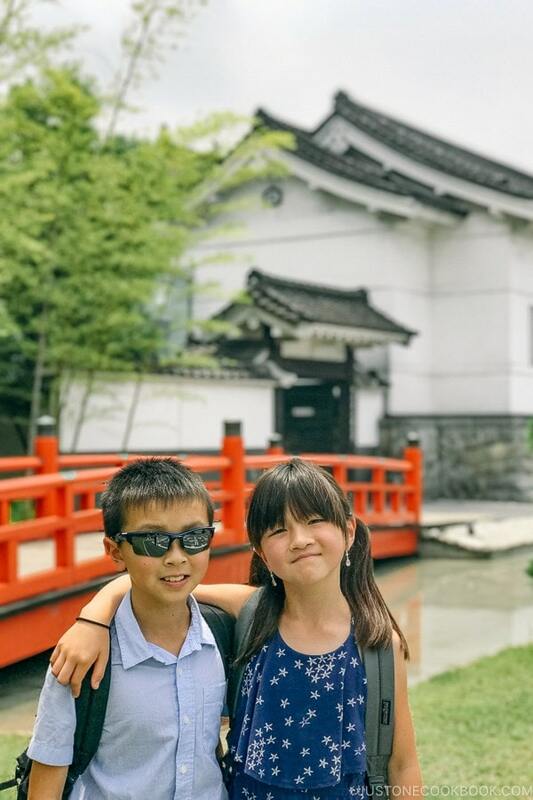 Great pictures of your kids, too — they’re really growing up! Thank you for your comments. We love Kikkoman soy sauce and by making the soy sauce the traditional way rather than using chemicals, you can taste the great umami flavor. 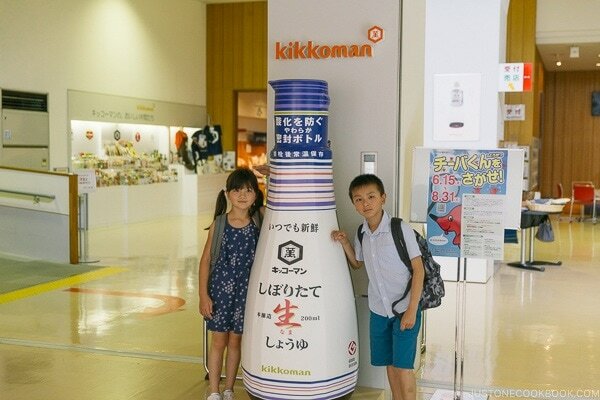 Thank you for sharing the Kikkoman factory tour. I too like learning how things are made and always look for factory tours wherever we travel. And how fun it must have been to make your own shoyu! Thank you for all the great recipes! Thank you for the sweet comments. 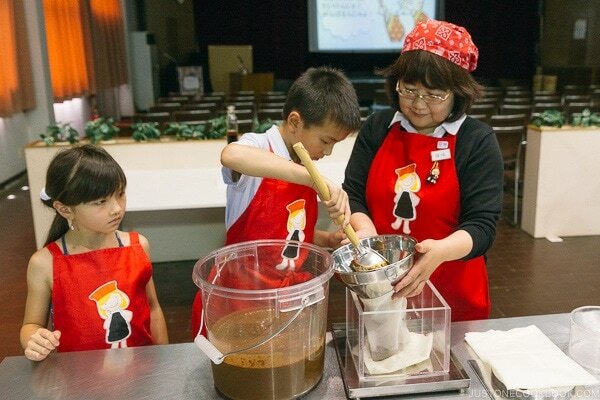 We’ll search for more food factories in Japan this summer and share on the blog. 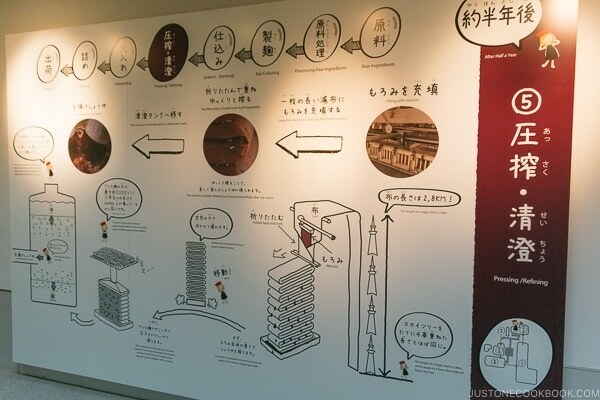 Nice to know how Kikkoman soy sauce is made. Thank you. Thank you for your comment. 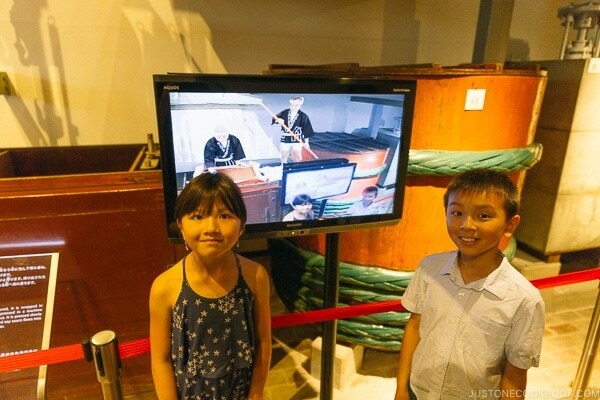 Our kids are nice enough to put up with us dragging them through different experiences without complaining too much. This is very interesting. 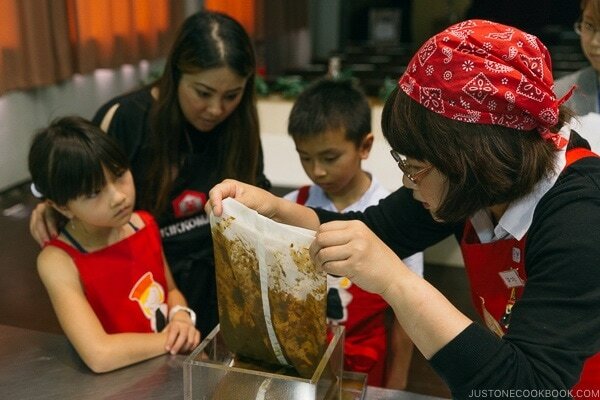 Would you ever attempt to make homemade soy sauce? I think that would be a great addition to your wonderful site. I think it’ll be challenging as the secret recipe lies with the koji strand, everything else you can buy in a supermarket. Plus we would need to wait for 6 months to see if it tasted good. Thanks for the report soy sause-making process. I enjoyed it. I’m a Japanse male. I always look forward to reading your articles, which makes me proud of our food culture. Keep on doing a good job. Japanese food is so fascinating, the true Japanese food hardly gets exposed outside of Japan and we’re trying our best to share. Thank you for your comment.